Kitchen renovations are stressful, but they sure do produce a fantastic amount of boxes and packing material. 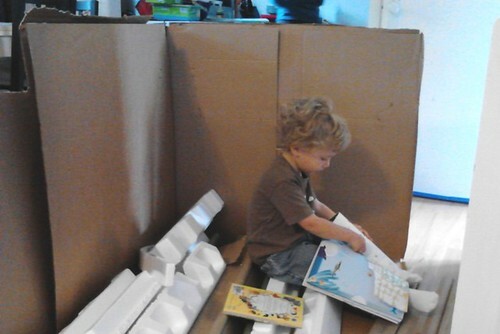 A curly haired boy takes a moment to enjoy some stickers in his box fort. *Please forgive crappy cell phone photo. The camera batteries are currently being used in the electric screwdriver. Our house will never be clean again. At least, that how it feels in the midst of this kitchen renovation. Curly did very well at the dentist today. The hygienist was chipper and friendly and let him play with her “friends,” “Mr. Slurpee” and “The Water Gun”. Surprisingly, he really liked “Mr Slurpee” the sucker tool and happily closed his mouth on it. I’ve always found it a little unsettling myself. He wasn’t a fan of laying back in the chair, so she kept him mostly upright. The dentist wasn’t as great. Very brusque, not warm, kept calling Curly by the wrong name. And insisted that he lay all the way back, which resulted in some tears. The counting of teeth and fluoride application were over quickly though, and we’ve got a clean bill of health and the news that braces will be in his future for sure (no surprise there). Curly was thrilled to get a goodie bag, until he looked in it and saw there was only 1 sticker and assorted dental care items. And honestly, why do dentists give out lollipops? Especially when the kid has just had a fluoride treatment and can’t eat or drink for 30 minutes! We are getting ready for Curly’s 3rd birthday party (pirate-themed, arr!). It’s the Saturday after his actual birthday. We’re going to have a 3 year old in about 2 weeks, whoa. He’s plateaued with potty-training. We were off to such an auspicious start many months ago, but still have some hurdles to overcome, such as him actually asking on a regular basis and holding it during naps. If he’s not 100% potty-trained by September, he’ll be “held back” from the pre-school room, although we’re pretty sure he won’t be alone in that regard. He’s probably 60% trained at this point, but holding steady. We are getting our kitchen completely renovated. It started this morning, when the contractor and 3 other guys knocked on the door at 8am and the chaos began. We’ll share ‘before’ and ‘after’ photos. Curly is thrilled that there are “construction workers” not only at his school building the kids a new playground, but in our house as well, building us a new kitchen. 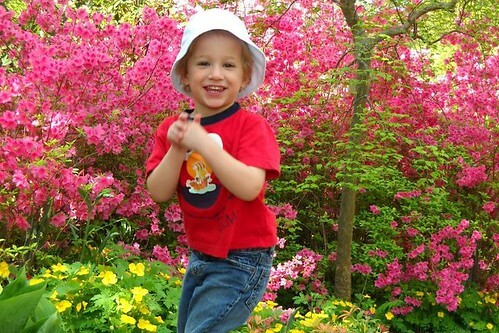 Passover seders are no fun for almost-three-year-olds, but easter egg hunts are pretty awesome in his opinion. The boy’s first dentist appointment is this Wednesday. I hope it’s not awful. Speaking of awful, we got the dreaded notice of pink eye going around our daycare last week, and this weekend Curly was showing signs of it. He HATES the eye drops. Actually, hate is probably not a strong enough word. To administer the drops, we have to lay him down, one person holds his arms up alongside his head to keep his head facing forward, the other person has to basically sit on him, and we have to pry his eyes open to put the drops in, all while he’s screaming. Fun, no? We’ve tried reasoning and bribery, sadly to no avail. Scene: Nutella is laying down on the couch and Curly climbs up near her feet. I go on your leg. I go get my movie. I got my pillow…my back! I go be stuck again. Do find me! Go find me! Move back all the way over here, ok? I stay on the couch. My pillow. Get off! Get off! I put it on….on this. I going take your pillow. And then I had to put the pasta in the water. Whew. The mind of a toddler. Scene: Backyard BBQ on a lovely warm Spring Saturday. People are standing around chatting with snacks and drinks. There is a large bowl of bright orange puffed corn “cheese” snack on the table. Ima is indulging in this bad snack. I’m betting when he figures out they’re not actually worms, he’s going to be pretty mad. But maybe he’ll still never want to eat them. As many of you know, I’m a baker and a crafter and this weekend, I got to share both passions with Curly. About a year ago, I bought a little over a yard of a fantastic banana printed cotton remnant. Crafty people will understand what I mean when I say I just couldn’t pass it up. I finally decided to make 2 toddler sized aprons with it (one for Curly and one for a friend). I backed it with some royal blue cotton that I had in my stash. I had mostly finished the project up on Thursday in anticipation of a trip out of town this past weekend to visit the family of the other little boy. When that trip had to be canceled last minute, I told Curly that we could bake cookies together instead. He kept pointing to the little apron hanging on the back of his chair and saying “You made that?” I gave him my Cookies for Kids Cancer cookbook and told him he could pick out any recipe he wanted. Much to our surprise, he picked out the classic NYC bakery staple, Black and White cookies, which to our knowledge he’s never had before. I guess the picture was compelling. On Saturday afternoon when he woke up from his nap, I was all set up for baking on the dining room table. He was SO fascinated and helpful. I measured, then let him pour. I even got out my rarely used 1/8 cup measure so that I’d need 5 scoops to make up the amount needed for an ingredient. Then together, we counted. I even let him taste the dough, which has always been part of the process of baking for me, although I think he’s a few years away from full on licking the beater clean. It was a very nice “full circle” motherhood moment for me. I can’t remember a time when I wasn’t helping my mother in the kitchen. Those childhood memories are warm and sweet. They smell of chocolate and vanilla and cinnamon and are full of love. I want those memories for Curly. 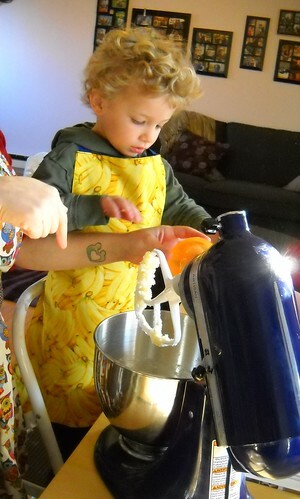 And I look forward to many more sweet hours of him wearing the banana print apron as we whip up tasty treats to share. Oh, and the cookies were just ok in my opinion, although Strawberry loves them. Curly enjoyed one but they didn’t seem to stick in his memory and he hasn’t asked for another. Yesterday morning, Curly was playing with Legos and we were still enjoying our breakfast and newspaper at the table. 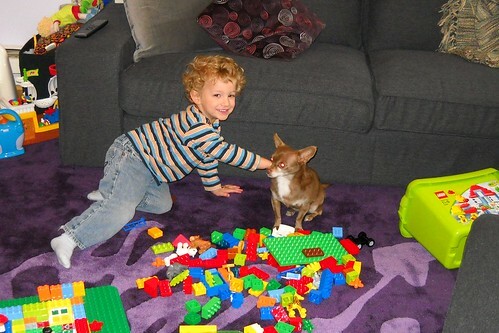 It was fairly quiet until I heard Curly ask, “You play Legos with me?” and I turned to look at him and saw he was talking to our dog, Hazel. He asked her again, “You play Legos with me, Hadel?” (that’s how he says her name, z’s are hard). Nutella and I shared a look with each other, like, omg how adorable is that? and then said “[Curly], Hazel can’t play Legos since she doesn’t have hands, but she seems very interested in what you’re building!” Sure enough, Hazel was sitting near him and watching what he was doing closely. I grabbed the camera and ham that he is, Curly started gently petting her for the picture (evidence below). Today, he was sitting down when Hazel walked up to him to sniff at him. He smiled and said “Hadel makes me happy.” A boy and his dog.